Summer was slow starting here in the Maritime Provinces this year. Our backyard gardens were slow to grow and we are now picking the spoils of our work. I don’t have a large garden but neighbours close by do and they were wonderful enough to send me some vegetables. The first lot was cucumbers, onions and a couple of green peppers. 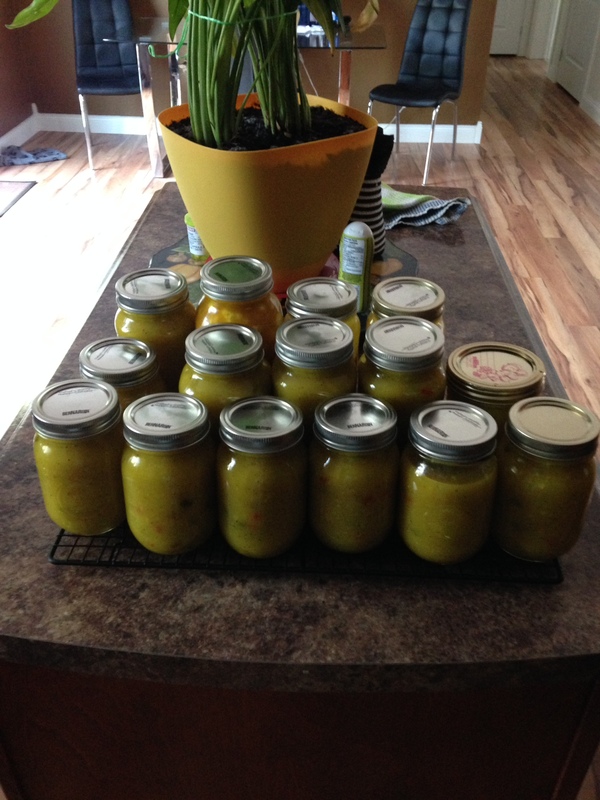 I make a mustard relish each year and the vegetables they sent are most of the ingredients I needed. My daughter and grandchildren were here and we set out to make a batch. Well there were so many cukes we ended up making 2 batches. More to share with friends and family. Everyone participated. My daughter is a Tupperware representative so she and I have all the latest gadgets. We used the Quick Chef Pro, Power Chef, and Chop ‘N Prep. The chopping was done in a jiffy, even the little ones could work the equipment with no fear of harm to them. Best of all no tears from the onions! If you would like to make some the recipe is below. This relish is REALLY good. Now to keep a bottle hidden until Christmas! In a large saucepan combine: 3 cups sugar, ½ c flour, 3 tablespoons dry mustard, ½ teaspoon turmeric, 11/2 teaspoon celery seed, 3 cups white vinegar, 1 cup water. Mix. Bring to a boil and let simmer ½ hour, stirring frequently.